Will's Korean Journey: The Biggest Sporting Event. In the United States, we very often claim that we have the biggest sporting events in the world outside of the Olympics. Even with the Olympics some think that the Super Bowl is still a larger event. However, this view, while prevalent in the United States, is also entirely an ethnocentric view. No offense America, but it's true. I used to be one of the people who thought that the Super Bowl was watched across the world. I used to think that the same mentality we approached Super Bowl Sunday with was replicated across the civilized world with us. However, having spent the last two Super Bowls in a foreign land, I have come to realize the error of my ways. The Super Bowl, even the one two years ago that Hines Ward (Korean-American and a Korean hero of sorts) played in was not that important. It was broadcast, but it wasn't important. Enter an event that happens every 4 years except in America. Well, ok, it happens in America too, it's just that almost nobody notices it. The World Cup, is truly the largest sporting event in the world. Entire countries come to a standstill for the qualifying rounds. Civil wars in Africa are suspended until their countries team is eliminated. Sorry Football, but you've got nothing on the World Cup. I will be one of the first people to admit that for the longest time I didn't understand the World Cup. It was soccer, who cared about soccer. Who in America even played soccer? David Beckham in all his manly glory couldn't even get America to care about soccer. All of that changed in the summer of 2006. After graduation my friend John and I found ourselves on a plane bound for Europe. We found ourselves in Berlin on week before the 2006 World Cup kicked off. The World Cup which Germany just happened to be hosting. A week before the World Cup, and the excitement in the air around Germany was palpable. Everywhere you looked you saw signs, fans, and soccer stuff. However, even this was not enough to make me respect soccer. It was Italy, more importantly, it was Florence that finally sold me on how huge soccer was. I was in Italy for two weeks of their magical (see dive) run in the world cup. Every place in Italy was cheering their heads off. 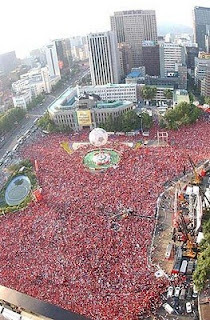 I saw entire cities mobilized to cheer for a team that wasn't even playing in the same country that night. The entire city of Florence shut down for a game. After Italy won there was a city wide celebration. This game wasn't the final, it was just another game, and still after the victory, the entire city celebrated. Every park was full of huge projections of the game and lots of cheering fans. It was a sight to behold. After returning to America I realized just how important soccer is to the rest of the world. I saw the sheer ecstasy of a win, and the utter-disillusionment of a loss. It was one entire month of Super Bowls. Every nation cheered for their team with passion reserved for only the die-hard fans of America. Instead of one crazy cheesehead, it was millions. This year, the World Cup has found its way to South Africa. This is the first time that the World Cup has ever been held in Africa. Yet, I find myself here in South Korea. South Korea, which, just happens to have probably the best Asian team in the tournament. The expectations here are huge. In 2002 South Korea made an improbable run to the semi-finals. I think it should also be mentioned that South Korea co-hosted the World Cup in 2002 with Japan. In 2006 South Korea failed to make it out of the group stage (1st round). This year, thanks in part to being placed in one of the easier groups, the expectations are that South Korea emerges from the group stage. Not only are the expected to advance past the group stage, they are expected to win a few games once they get there also. Anything less would be a huge disappointment. South Korean fans are also fanatical when it comes to the World Cup. In Seoul, there will be several parties where people will gather outside to watch the world cup. Some of these parties will have more then 50,000 people in attendance. No, I'm not making this up. Still don't believe me. Watch the video. I for one, seek to embrace this rare chance to participate in the World Cup. I find myself in a country that cares about it, and I have an adopted team to root for. While I will always root for the United States to do well, I will be cheering for South Korea. Here is to World Cup fever.